Intro from Jay Allison: For the Season of Gifts, we have a Jeff Towne review of another tiny new digital audio recorder, this time the Marantz PMD620. The 620 is getting pretty close to the mark, but still has a few weird quirks that may drive you crazy, or maybe you can work around them. Check out all Jeff’s thorough, radio producer-specific reviews at Transom—lots of pictures, details from field use, comparison charts, and audio samples with various microphones. Marantz has a long history of making professional audio recorders for journalists. Their PMD 222 cassette decks can still be seen in service today, and their PMD 670 was one of the earliest professional flash recorders designed for reporters. Considering this history, it’s no surprise that Marantz got a lot right in the design of the PMD 620, their smallest recorder yet. It’s also surprising that they got a few things very wrong. On the positive side, although it’s very small and light, the recorder feels very sturdy and well-built. It’s still mostly plastic, but there’s some well-placed metal components, and the switches and buttons feel solid. It sells for about $400 US. 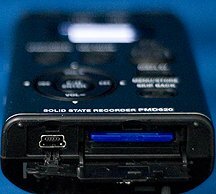 The access doors for the SD card and USB port feel a little flimsy, but that’s certainly not unique to this recorder. Recording is started by one press of the large REC button, and a red light around it glows solidly when a recording is rolling. That red indicator blinks when a recording is paused. Input volume is on a hardware rocker switch on the side. Most importantly, audio quality is very good, even when using external microphones. The recorder starts up fast, ready for recording in only a few seconds, and can operate for over four hours on two AA batteries. Controls are fairly obvious, and even the settings that are buried in menus are fairly easy to access. Record settings can be stored in three presets, allowing fast access to one’s preferred set-ups. File type (.wav or MP3,) sample rate (44.1K or 48K for .wav files,) bit-depth (16 or 24,) stereo or mono, manual or automatic level control, input preference, and more, a total of 24 parameters, can be saved. This makes changing from stereo ambience collecting to mono interview recording, or high-quality wav file recording to memory-saving mp3 recording, much less menu-intensive. These presets reside on the recorder, and will not be lost if the SD card is reformatted. The presets can be copied from one 620 to another by saving a preset configuration file onto an SD card, placing that SD card into a second 620, then loading the configuration file. This way, multiple 620s can be set-up identically without laborious repetitive paging through all 24 settings, ideal for newsrooms, educational settings, and other shared-equipment environments. It should be noted that the 620 can record mono files, which take up half the space on SD cards that stereo files do. Many of the other small machines only record stereo files, or require odd contortions to record mono. When in mono mode, the signal is directed to both channels for monitoring. The 620 ships with a cradle with two connectors on the back: a belt clip and a standard photo tripod socket that allows the recorder to be mounted in a stable position. It’s plastic and flimsy-feeling, but effective, and allows access to all important controls. As with most of these small, relatively inexpensive recorders, the mic preamps are not quite as clean as we might like, and have less gain than some of the higher-end professional recorders. 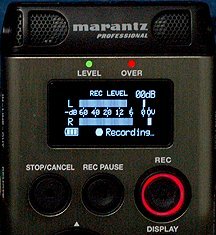 However, the 620 makes relatively clean recordings, sounding clearer and less hissy than most of the other small handheld flash recorders, including its larger predecessor, the Marantz PMD 660. This is especially noticeable when using external microphones. There is only a mini jack for mics, so one needs an adapter cable to use a professional microphone with an XLR connector. This machine does NOT provide phantom power for condenser mics, despite the manual’s confusing use of the term. It CAN provide "plug-in power" for certain small electret microphones, but not the standard 48 volt phantom power required by most professional mics. Because of that, one must either use a dynamic mic, or a condenser mic that has an internal battery. The input gain has to be turned up very high for use with dynamic omni mics, such as the Electrovoice RE50 or Beyer M58, but the 620 can actually make a decent recording using mics like those. It does even better with higher-output condenser mics, showing only a very small amount of background noise. The internal mics are of decent quality, serviceable in most situations, but a little bright and edgy sounding compared to the mics on the Zoom H2 or H4. 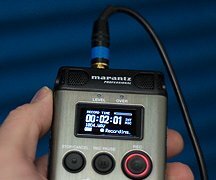 In an odd contrast with other similar small flash memory recorders, the 620 actually seems to sound cleaner when using external microphones than with its own built-in mics. The 620 even has a built-in speaker for those times one just can’t bear to put the headphones on. It’s a tiny speaker, so of course it’s tinny and not all that loud, but it could be handy in certain circumstances. On the negative side, there are a few design problems that make the 620 problematic. The headphone jack is located directly in-between the two microphones, putting the protruding cable in an inconvenient place if using the internal mics to interview someone. Additionally, the cable can tap against the microphones if one is moving around. IMPORTANT UPDATE! In April of 2008, Marantz released a firmware update, available here>> . This update fixes an annoying monitoring latency problem as well as a few other issues. There is a "ReadMe" file packaged with the download that explains the process, which can be easily done by any user. Basically one copies the downloaded file onto an SD card, puts the SD card into the 620, powers it up, and the display will ask whether to update. Select "yes" and the 620 will update and restart. So the following complaints about monitoring latency are now moot, but we’ll leave them here to describe the original recorder. Much more troubling is the short delay in the sound reaching the headphones, presumably a latency caused by monitoring the sound after it has been through the electronic processing of the record circuit. It’s a very short delay, but just enough to make it difficult to speak while monitoring on headphones. There’s something very unnerving about hearing one’s voice on a short delay, making it difficult to speak naturally, something to keep in mind if one is planning on using one’s questions in the final production. This very short delay is less of a problem when monitoring someone else speaking, or other sounds in the environment, but it does make it harder to accurately assess the sound being picked up by the microphone. My fear is that users will stop wearing the headphones, or take one ear off, resulting in less-careful placement of the microphone, potentially allowing more P-pops, or the subject drifting off-mic. Between the headphone jack placement and the monitoring latency, it seems that Marantz doesn’t think that people wear headphones while recording. But watching meters is not enough: careful listening through good headphones is the only way to verify proper mic placement, and that a bad cable, or external noise in the environment, isn’t going to ruin the recording. Less severe, but still worth considering is the issue of mechanical noise. The lack of moving parts makes these flash recorders wonderfully quiet for close-up intimate recording. But sometimes, buttons and switches can make noises that show up on the recording. The 620’s record-level controls are on a rocker switch on the right side of the machine, and are easy to adjust on the fly, but pressing the up or down makes an audible click. It’s not very loud, but it IS audible in quiet environments. Similarly, the LCD screen shows record-level meters OR a time display, not both at once. Toggling between the meter display and the time display requires a button push, and that button clicks. This is a large concern when using the built-in mics, less so when using an external mics, but worth preparing for in either case. One should try to get a good level before critical recording begins, and only change the input level while recording if absolutely necessary. It’s always safest to leave the screen displaying the input levels, to make sure that the recording is in the safe range, but if it’s important to watch the time display, there are two handy indicator lights above the screen: a green light shows that there is a signal present, the red one will light up if the signal has clipped, the result of too much level into the inputs. The screen itself is easy to read, with large numbers and meters. Unfortunately, the display gets washed-out in bright sun, but is very good in dark environments and typical room lighting. Automatic Level Control is fairly good, reducing peaks and returning to normal record gain settings fairly smoothly. This is not always reflected in the headphone signal, a loud spike can create distortion in the monitoring chain even when the recorded signal is clean. Switching the ALC on (one of the selections in the preset set-ups) will cause the input gain to be set fairly high, increasing the average noise floor of the recording. Loud sounds can cause some "pumping" artifacts as the gain circuit reacts to the changing input, so one is usually better-off setting levels manually if possible. But when encountering unpredictable environments with wide ranges of loud and soft sounds, the ALC can be a life saver, and this implementation sounds relatively good. There are two internal pad settings (also located within the preset set-ups) which reduce the sensitivity of the inputs, for recording loud sounds. These pads work well, allowing for undistorted recordings of amplified music, raucous crowds, explosions, or other such challenging sound sources. 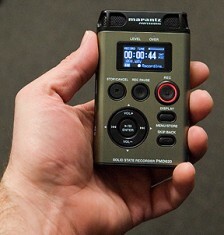 This aspect of the PMD 620 is one of the things that makes this recorder more suited for radio reporters: the microphone gain is relatively high, but can be reduced in loud situations. Most of the other small flash recorders seem to be designed to record loud sources, and simply cannot provide enough gain for quiet ones. Another useful feature is the flexibilty of track marking. In manual mode, while recording, another press of the (quiet) record button will start a new track at that point, without pausing the recording. Marantz does not guarantee that the transition between tracks will be seamless, but in practice there seemed to be only a minor disruption to the waveform, which was barely audible, and fairly easily repaired in a digital editor. But it should be noted that the track transitions are not completely transparent down to the sample level. There are auto track marking settings as well, creating new files automatically at predetermined time intervals of 1, 5, 10, 15 or 30 minutes, or 1, 2, 6, 8, 12 or 24 hours. Automatic track marks make for easier navigation through very long recordings, and ensure that recordings are saved, even in the event of batteries falling out, or a power cord becoming disconnected before a file is saved. If batteries run-down during a recording, the 620 will automatically close and save the active file before shutting down. While playing back, sections of a file can be marked and copied, allowing for faster access to, or transfer of, those sections of audio. This can be especially useful in time-sensitive situations. Files can be browsed, played and deleted with a few clicks through the menu. In most cases, it’s more practical to transfer the original recordings to a computer for editing. Audio is easily transferred to the computer via the mini USB connection, and the recorder automatically enters data transfer mode when the USB cable is connected. The built-in USB circuit is very slow, the deceptively-named "full speed" rather than the much faster "high speed," so using an external card reader will make for significantly faster transfer of large files. The 620 can use most standard SD cards and larger SDHD cards. The 620 can make very long uninterrupted recordings, restricted only by the size of the recording media. The 620 can supposedly handle a 2 terabyte SD memory card, but it’s unlikely that we’ll see one of those any time soon, and files that large would be pretty ungainly, and likely incompatible with most editing programs, even computer OS restrictions. Nonetheless, it’s good to know that the 620 can record past the 2 gig file limit that some recorders impose. The inevitable menus are easy to navigate via the up/down left/right and select buttons that double as transport controls during playback. With its small size, easy operation, and relatively clean sound with popular reporters’ microphones, the PMD 620 is almost an ideal choice. The monitoring latency poses a serious problem, making it difficult to accurately monitor a recording, especially in an interview situation. (The original monitoring latency has been eliminated via a firmware upgrade.) The small amount of background hiss, the mechanical noise from button-pushes, and the unfortunate location of the headphone jack are annoyances, but can be worked-around. Whether one can live with the delay in the headphones is a bigger concern, how severe a problem this is may vary by user. But it’s one of the few downsides to an otherwise useful, convenient recorder. I’d wanted to include a sample of how the 620 did out in the wind, but it’s been oddly calm around here… so I haven’t been able to test this! I will update when I get a chance. One thing to keep in mind: the built-in mics are omnidirectional, which will make them somewhat less prone to wind rumble than more directional mics. They won’t be immune to it, but less severely impacted by light breezes than the highly directional mic capsules in the Zoom H4, for instance. Although the 620’s mics are omnis, their spacing does result in a stereo image, although one less vivid than either of the Zoom recorders. I’m a songwriter and want to use this recorder for laying down ideas when I’m away from my studio. Been using a Sony cassette recorder (yuk) about the same size as the 620. Anyway – if I don’t want to have to deal with headphones – how is that speaker? Is it about the same quality as, say my 14" Apple iBook G4 portable computer? Which is to say – small and not hi fidelity in the slightest but not awful. There’s a sound clip of the sound of the speaker in the review, and I think it gives a good sense of it: it’s tinny, and not all that loud, but you can hear what’s been recorded… I held the 620 up a few inches from a high-quality, full-range studio mic (an AKG 414 if anyone’s interested)and recorded directly into Pro Tools. So I’d say the sound is not quite as good as your iBook, it’s only one mono speaker, and smaller. But if you just need to hear some lyrics, or a basic melody, it might suffice. You won’t be able to hear much musical subtlety: imagine you’re listening to someone on a cell phone. I can imagine it could be handy for listening back to an interview for logging purposes, but headphones will be required to hear any detail. Yet more competition in this space. Every year Olympus voice recorders seem to get a little more sophisticated. Check out the soon-to-appear LS-10 Linear PCM Recorder. Records to Linear PCM, MP3 and WMA formats. Has 2GB built-in flash and support for addition memory up to 8 GB). Wow, thanks for the heads-up on that one Alan! As always, the proof is in the listening, but that looks pretty cool, and I like how tiny it is. A couple of other nice things: a record volume dial, aluminum body, stereo speakers! That looks like a good one, Alan. We should get one to test. We just ordered the Sony PCMD50 for Jeff to check out. Here’s another heads up. Seems complicated, a recording system based on combining two devices but who knows? It might work well for some people, especially those who already have an iPod. it seems the 620 does not are not compliant with the RIFF spec and may cause problems if you need to convert to the BWF format. Hopefully a future revision will correct this. I read a lot of very good reviews on the Marantz 620 and decided to buy it for my fieldwork research. I bought it mainly because reviewers said it was built very well. In my opinion, it is not well-built at all. And more disappointing, it stopped working after only 3 days of use. I’ve not been able to get it work since and will send it for repair. Back to the so-called "great build quality"
My first impression when I picked it up was "It feels like cheap junk". The grade of plastic used in construction feels very junky and too thin. The switches also feel cheap and weak. For the price, the unit should have a metal body. My Cowon iAudio X-5 is far better constructed. The battery door feels like it will snap every time I change batteries, and the SD card door also feels very flimsy. Why do manufacturers develop good products, then cheap-out on the construction and instead of spending $0.25 on a metal hatch or door, they spend 0.05 and make a bad plastic one. Major upgrade via firmware update! This makes the 620 much more attractive as a reporter’s tool, making it much less annoying to actually monitor what one is recording! I’ll agree with coolrat33 that the battery door and SD cover are pretty flimsy-feeling, but overall, the 620 felt pretty solid to me. Now, that’s in comparison to other similar recorders, like the Zooms, and the Edirol. It even felt more sturdy to me than the larger 660 or 670s. It’s not as solid-feeling as the Sound Devices recorders or the Sony D50, but then, I don’t think I’d feel good about dropping any of them. I think the Sound Devices are the only ones that I’d feel confident of working for many years, but then they cost a lot more, I’d hope so. Coolrat,if your 620 stopped working after 3 days, then there obviously was something wrong with it, and should be returned to the place you bought it for a new one. I used ours for several weeks and found no problems. Will the hatch doors break? We’ll see, and in the end that’s all that matters, if they keep working, I suppose we shouldn’t worry about whether they "feel" flimsy or not. And for my preference if this recorder’s onboard mic’s are a little crispier than the H2’s then that may be a plus, as I found myself having to add high end during mastering, to counteract the ‘woolen’ sound of the H2’s mics. Thanks for the research, even though I still think these little units are overpriced by half (at least) eventually, they will get it right. does anybody have experience doing nature recording with the Marantz PMD620? and does it compare with the praised olympus ls-10 concering recording quality?? some state that the olympus sounds a bit thin with bass not strong enough.and in some sound samples the 620 recordings seemes less crisp, but more natural with a far better bass component. but is this so, and may this improve with external mics? are both devices suitable for nature recordings? Hi mab – yes I’ve done some recent nature recording with the PMD 620, very nice results but I used an AKG external mic which is cleaner than the onboards. On one take the batteries died mid-take. I changed the batteries and a little message popped up in the window saying "recovering file" and lo & behold it recovered the file it was recording when the battery died. 4 minutes of it anyway. This is a nice feature which Marantz doesn’t seem to advertise. Does anyone have experience using this mic with this flash recorder? If so, what do you think of the sound quality for interviews in the field? Thanks. EK – I’ve had excellent results using the AKG C-522 mike with the Marantz 620 in the field. Its a stereo mike, not mono like the C-900 but maybe this info is a help to you. Just got one of these for one-on-one interviews. Is it possible to use two lavaliere mics and if so, anyone have any suggestions on splitters? Thanks. Any news on when the upgrade will be available again? I would also love to get the latest firware update. My PMD620 has v.1.14 installed. I may return it if I can’t update it. Has anyone got an archive copy of v.2.06, or had any luck getting it directly from Marantz? Would you buy this again? Problems? I had a 620 for a while and replaced it with a Sony D50. I didn’t break the jack and I don’t recall reading about anyone who has, but the Sony mic and headphone jacks appear to be metal-reinforced (the line in and line out jacks are not). I had a lot of theoretical concerns about the Sony but in real life, other than price, the only real issue is that it weighs a half pound more and is somewhat taller (but about the same width and thickness). The quality of the audio, both with internal and external mics, was a big factor. The Sony was clearly better when I did side-by-side testing with both. There are other potential issues – ergonomics, no mono, no MP3 record, memory media type, etc. – but in real life they weren’t factors for me. I should point out that the Sony will take 16 gig Mark 2 memory stick cards so the difference in removeable media capacity shouldn’t be an issue for most folks. The Sony simply got disqualified because of price. If money were not of any concern, it would have won. I would have missed the MP3 and mono capabilities of the Marantz anyway. PS: I found the best price by far on this unit at http://www.proaudio.com. Interesting that the firmware has incremented to v.27. I got an update from them a few weeks ago and it was v.6! I had the luxury of being able to do A/B comparisons of the Sony and the Marantz. For my purposes, the Sony was clearly better, but there are a lot of great recorders on the market and there are few bad choices out there right now. I used the Marantz with its remote and would highly recommend that, although it’s relatively pricey ($80, IIRC). From another review: Record level adjust while recording not possible. I just read review on the PMD620 and the review discusses how it is critical that one makes sure that the recording level is set before "critical recording" since the record level adjust buttons make a clicking sound that can be heard while record is in progress. Does the PMD620 really allow one to change record levels while recording or only in rec-pause mode? I’m asking because one, I think being able to make level changes while recording is useful and two, GearWire.com’s review (http://www.gearwire.com/fieldrecordershootout-003.html) of the PMD620 states that adjusting the rec level while recording is not possible. I read that review. Yes, level changes can be made while recording with the PMD620. GearWire is mistaken. It is also correct that a clicking sound is recorded if the levels are changed while recording and when any buttons are used while recording. Maybe someone with experience using Marantz’ remote can tell us if levels can be changed with the remote and whether all remote functions are silent. I have a freelance reporter in the field who says that files have literally disappeared from the SD card. She had recorded several interviews and now most are missing. She is using an 8GB SanDisk card. Might this have a problem with large files? I had the same experience with the PMD 620. You can adjust the volume levels while recording, but you are almost certain to hear the clicks caused by the button pushes. The remote eliminates a few of the reasons to touch the machine but doesn’t allow volume level adjustments. On the card question, I thought that the spec for the machine was that (unlike some others) it is unlimited as far as file size goes, as long as you don’t over-fill the card. I wonder if it’s like what I see happen regularly with cameras. You really have to format and erase files IN THE MACHINE. If you do file management tasks while it’s in a card reader, you are likely to have errors of exactly this type. I am only speculating, but this is neither uncommon nor strange. I noticed that the 620 has a rebate deal going on right now ($100 off! ), but you have purchase from an authorized reseller. There doesn’t seem to be any list of authorized online resellers on the Marantz Professional website. Are B&H and ProAudio.com authorized? Anyone know where I can find a list? They include a link to the rebate form. You have to purchase by 03/31/09. Hi, I just ordered a PMD620 due to the reviews and the rebate but also had questions about the dealers that were authorized. I called Marantz professional directly (630.741.0330) and they were able to help me out very quickly. FYI, the cheapest places around are DJDeals ($322 before rebate), Minidisco ($339) and B&H. All are authorized, but I ended up getting it from ZZounds who sold it for $305 – BEFORE $100 rebate!! Phone Saul Mineroff for a quote. My guess is that they are cheaper than anyone else. I’ve really enjoyed reading (and listening to) Jeff Towe’s reviews on Transom. I’m shopping for a digital audio recorder for a couple of uses (1. to record narration for video editing, 2. to record an audio journal of a journey across the ocean by small boat, 3. to record interviews with family members). My priorities are that the device have high quality sound, be of manageable size, and not prohibitively expensive. My search thus far has been narrowed down to the Marantz PMD620 and the Sony PCM-D50. Can Jeff (or anyone) offer any recommendations between these two devices, or other alternatives I should look into. Help will be very much appreciated. I don’t own a Sony PCM-D50 and have never used one. However, I do own a PMD620 and frequently use it for my podcast. I’ve never used the PMD620 to record a narrative track for video or film, so I can’t help you there. The key would probably be using an appropriate external microphone and finding a studio-like environment. 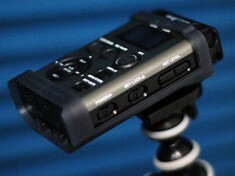 I think the PMD620 would work well for family interviews, either handheld or mounted on a tabletop mini-tripod. The PDM620 has a mounting clip that attaches to any standard-thread tripod. For my podcast work, I usually hold the unit between me and the subject, taking care not to touch the controls or otherwise create handling noise. The only major issues I see with using the PMD620 on a transoceanic boat trip is ind noise. With its built-in mics, the PMD620 will pick up a fair amount of wind noise. It might be possible to retrofit some kind of windscreen to the recorder, but I’ve never done this. Whatever recorder you decide on, I’d buy two so you have a backup in case one craps out in midocean. a recent podcast of mine recorded entirely with the PMD620. I handheld the unit about six inches from my mouth while sitting in a small compartment on Amtrak’s California Zephyr. When using an external mic my PMD620 has really, really, really low levels. I am using a sennheiser MD 46 cardiod. The internal mic works just fine. It’s my understanding that the pre-amps in this model are not that powerful and that some dynamic mics do not work well. That said…I have been using the older style Beyer M58 dynamic and getting very acceptable results. I have a 620 that I use as a backup for radio interviews. I’m trying to decide if I should replace it. The door for the memory card slot broke early on, and I use a rubber band and homemade metal brace to keep it in place. Two recurring problems: One is that the recording just quits sometimes. Can’t figure out why. So I keep it in “lock” position, and that works most of the time. The second thing is that the files on the card [16GB] randomly get messed up. I get an “error message 36,” which I understand to be a file transfer problem from wav to my Mac. I’ve been able to fix the problem most times. But I lost an important interview last week because of this, and now I’m trying to determine whether the chip is the problem or the recorder. I was unable to get help from Marantz. And the only other person I know with this recorder hasn’t had problems like these. Thoughts about possible fixes? Guidance? At the same time I’m thinking I don’t want to risk it anymore and should just get a new machine — a Tascam 44 or 100? I had a similar involvement with the PMD 620. You can alter the volume levels while recording, yet you are practically sure to hear the snaps caused by the catch pushes. The remote dispenses with a couple of the motivations to touch the machine however doesn’t permit volume level changes. On the card question, I imagined that the spec for the machine was that (not at all like some others) it is boundless to the extent document estimate goes, as long as you don’t over-fill the card. I think about whether it resembles what I witness routinely with cameras. You truly need to organize and delete records IN THE MACHINE. In the event that you do document administration undertakings while it’s in a card peruser, you are probably going to have mistakes of precisely this sort. I am just conjecturing, however this is neither unprecedented nor peculiar.